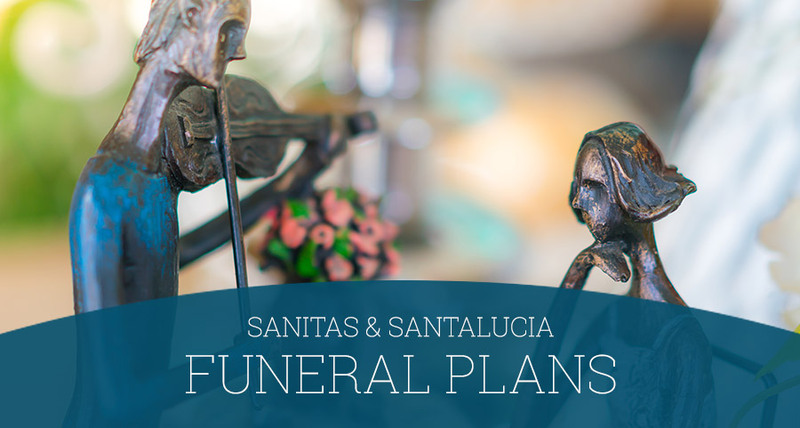 In collaboration with Santalucia the biggest provider of funeral cover in Spain, Sanitas can now offer you the most complete plan that can adapt to your family. The cover is specific to all ages and also has travel assistance and juridical protection for any eventuality. Includes funeral car, ark (optional for ash urn), hearse, signature book, accompanying cars, niche engraving, cemetery rights, grave plot, funeral service, tombstone and placement, flowers, co-ordinated management for the above. Optional nursery service for children up to 7 years of age, maximum of 150€ and three days of assistance. Psychological service only for traumatic situations ( ex: loss through an accident where the child survived ) also available for children under 17 years of age. National and International transfer – costs required for transferring of the insured from anywhere in the world to the cemetery or crematorium in Spain in the town designated by the family. Supplement available for countries other than Spain. Plane ticket or other transport if required for one companion. Accommodation costs up to a maximum of 10 days: € 125 per day in Spain and € 150 per day abroad. Home care for the family if the companion leaves children under 17 years old or family over 65 years old at home. Compensation for expenses up to a maximum of €60 per day. Maximum of 10 days. 2 months for funeral cover in Spain. 3 months for juridical assistance coverage. 3 months if the assistance is carried outside Spain. Annual evaluation in order to detect possible pathologies. Whenever the geriatric assessment so determines necessary, a support service will be provided for fixed or mobile and will be connected with 24 hour telephone assistance. Emergency service and immediate assistance if necessary. Inheritance, inventory of assets, equity transactions, etc. Leases: advice on the steps for the subrogation of the rental contracts. Pension processing: For widows, orphans, disability and / or death grants. Management declaration of heirs, from the signing of acceptance or waiver inheritance and registration in the Land Registry. Partial or Permanent disability due to accident. Interpreter- in case of hospitalization outside Spain. • Companion- in case the transfer is in case of death of the insured. • Expenses for the stay for the companion in case of death of the insured. CANCELLATION POLICY: notice one month prior to the renewal of your contract.